I was delighted to go to Barnes and Noble and find Inside Crochet magazine on the shelf! 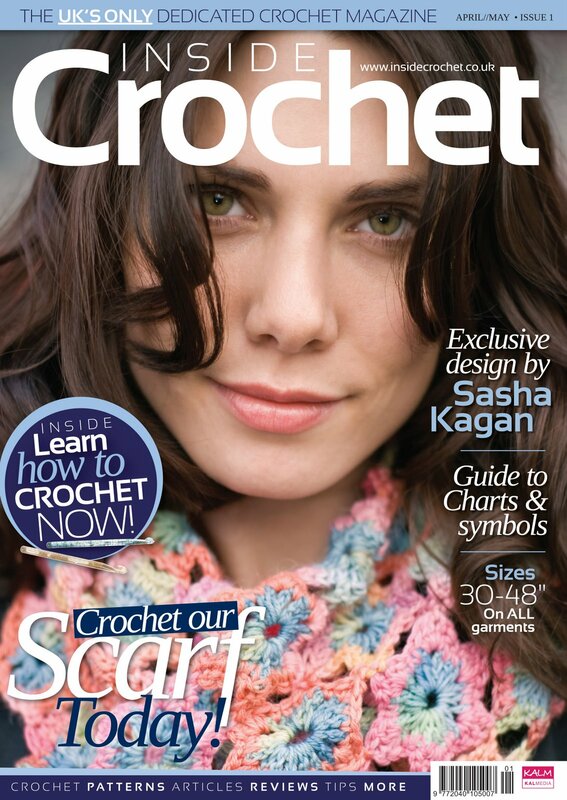 Inside Crochet is the the UK’s newest and only crochet dedicated magazine. Most crochet enthusiasts have waited awhile for this new crochet magazine to hit the stands and I am happy to say, that the wait has not been in vain! The editors Julie Holetz and Amy O’Neill Houck have obviously put much time and effort into determining just what crochet lovers would want in a magazine dedicated to their favorite craft. It certainly helps that they are both avid crocheters and needlework designers themselves! This first issue is chock full of all the things one might expect from a needlework magazine: great tools; favorite products; timely articles on eco-friendly crochet; crochet book reviews on some of our favorite authors….but Inside Crochet goes so much further than I expected! Inside Crochet has wonderful step-by-step photographs on how to crochet for the beginner. But if you are not a beginner, you don’t need to feel left out. There is a wonderful article on understanding Charts and Symbols that will have you tackling a skill that perhaps you thought you might never master. And several of the patterns are rated for the Intermediate stitcher. I love the size of the beautiful color photographs…I love the size of the graphs, schematics and the charts….I even love the size of the advertisements…who cares that they are geared for the UK…because I love browsing all things crochet and yarn, it doesn’t matter! I don’t think there is one thing that Julie and Amy has left out of this issue! Between Crochet on the Net, Inside the Crochet Studio of Claire Montgomerie, Dates for your Diary, Indy Yarn Profile and more….they have covered all the crochet bases! Of course, you will love the wide variety of crochet wearables from some of your favorite designers, also. Just remember, though, that the crochet terms used in this book are UK terms. ♥ Favorite Feature: On most patterns, the editors give wonderful YARN ALTERNATIVES for the design. What makes the alternative special, though, is they list them according to price range; SAVE, SPEND AND SPOIL YOURSELF Love it!! Bonus: for those who belong to Ravelry there is a Inside Crochet Ravelry Group devoted just to the magazine. Being a crafter and needleworker most of my life, naturally I love all things related to sewing and crafting. 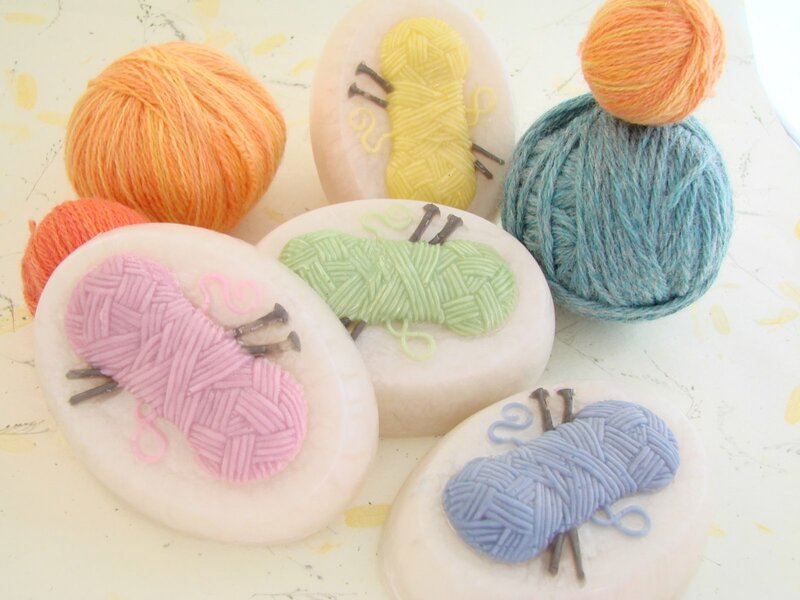 So you can imagine how thrilled I was to come across these adorable knit soaps? Aren’t they the cutest things? I just love them! They are from a company called Bramble Berry, who sells all kinds of soap making supplies. I believe you can purchase all the supplies you need to make the knit soaps right on the website. They have a great selection of soap making molds and products to choose from. Check them out. You might find yourself starting a new, fun hobby!